A California Sport Fishing license is required of anyone 16 years of age or over, fishing any waters in Mono County (Note: A California or Nevada Fishing License works on Topaz Lake). Purchase your license online now from the California Department of Fish & Wildlife or by calling CA DFW Telephone Sales (800) 565-1458, or in person at most regional tackle shops. 1-Day, 2-Day, 10-Day, and annual options available for both CA residents and non-residents. Pricing and more details at www.wildlife.ca.gov/Licensing/Fishing. Free Fishing Days: Two free fishing days are July 6, 2019 and August 31, 2019. On these days, you can fish without a sport fishing license (all other fishing regulations still apply though). Limit: General limits is 5 per day and never more than 10 in possession. See regulation limits that apply to specific waterways. Bona fide trout fishing season is the last Saturday in April through November 15 every year. In 2019, Opening Day, aka “Fishmas,” is Saturday, April 27, 2019. This is when most waters in Mono County are open to anglers to fish for as many as 5 trout to catch-and-keep per day (Always check local regulations. Some waters have special restrictions. View regulations here - https://www.wildlife.ca.gov/Regulations) or call 760-872-1171. Popular waters where these rules apply include Crowley Lake, Convict Lake, the Mammoth Lakes Basin, June Lake Loop waters and the Bridgeport Reservoir. 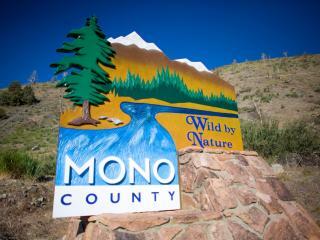 (For a complete list of Mono County Fishing Spots click here). From Nov. 16 through the last Friday in April all waters in Mono County (see exceptions below) are closed to fishing. - Hot Creek; east of Mammoth Lakes and ideal for all skill levels of fly fishing - Hot Creek is 0 take year round. (Barbless flies only, no lures or baits allowed. - Upper Owens River – (certain sections only); the river runs along Owens River Road, which travels east of US 395 between June Lake and Bishop. below Monument – 5 per day no gear restrictions during trout season except as follows: August 1 – Nov 15 barbless lures / flies 2 trout over 18 inches, Nov 15 through trout opener – closed to fishing. Note: Always check regulations here - https://www.wildlife.ca.gov/Regulations or call 760-872-1171. Topaz Lake, the large, sunny reservoir filled with rainbow trout, brown trout and Smallmouth bass, is on the California-Nevada stateline border, and has unique regulations. Topaz Lake is open for fishing January 1 through September 30 every year. Topaz Lake – either Nevada or California fishing will work here. If you have a Nevada fishing license you also have to have a trout stamp to fish for trout. What time of day can I fish in Mono County? - Hours are: One hour before sunrise to one hour after sunset. - Night fishing is prohibited in all Mono County waters except Topaz Lake, where fishing is prohibited from two hours after sunset to one hour before sunrise. - Night fishing is allowed on Rock Creek Lake (Inyo County) 24/7. Is there anywhere that I cannot fish? - Crooked Creek (below LADWP Gauging Station) is closed all year. - Rock Creek Diversion Channel is closed all year. Mill Creek and tributaries. - Mill Creek and tributaries. - Silver Creek and tributaries. - Wolf Creek and Wolf Creek Lake. - Junction Lake and tributaries. - Convict Creek – UC study area. - Other closures may apply. Need more info? For more information about fishing rules and regulations, please contact the California Department of Fish & Wildlife at 760-872-1171 or visit www.wildlife.ca.gov or one of the friendly guide services available in Mono County. Join the effort to keep our Eastern Sierra fisheries healthy and sustainable so that trout can thrive to trophy sizes - not only for your next fishing trip but for your great grandkids and their great grandkids! It&apos;s Simple: KEEP ONLY WHAT YOU NEED - release the rest to reproduce, grow and transform into trophy sized beauties! 1) Land your fish as carefully and quickly as possible. If you plan to release the fish, do not pull it up or land it on dry land - sand, rocks and vegetation damage the trout&apos;s slime covering that helps keep the fish healthy. 2) Avoid moving fish from the water - unhook and release the fish while it is still under water. 3) Only use wet hands and limit overall handing of the fish. Never use a rag and never squeeze the fish or touch its eyes or gills. 5) Use artificial lures (no bait) to minimize deep hooking. Barbless hooks or hooks with flattened barbs make unhooking easier and less stressful on the fish.